Dismissed by the betting public at odds of 16-1 in a field of 10, Harry J. Loso’s Pat’s No Fool scored a convincing victory in the $100,000 Maddie May Stakes for 3-year-old New York-bred fillies which was run at Aqueduct Sunday at a one-turn mile. 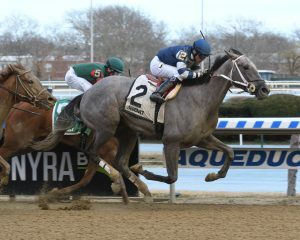 Based at Laurel Park and meeting fellow New York-breds for the first time, the grey daughter of Cross Traffic bested the competition with an impressive middle move and admirable staying power in the stretch in her stakes debut. Drawn in post two under regular rider Jevian Toledo, Pat’s No Fool lingered among the back markers in the early stages, coming six or seven paths off the rail and into the clear for the trip along the chute and backstretch. Up front 4-1 Flush was away first from post eight, but 2-1 favorite Shelley Ann charged up to her inside to strike the lead and set early fractions of a quarter and half in 23.81 and 48.26. Pat’s No Fool drew the eye when she accelerated as the field approached the far turn and gained a spot. Midway round the bend, in the matter of just a few strides, she engaged her five remaining rivals, struck the front and entered the stretch in full control after three-quarters went in 1:15.14. In upper stretch she drew away to lead by four lengths. As anticipated for such a speed-laden field, things looked like they could get interesting in the dash to the wire. As the closers made their bids, however, Pat’s No Fool opened up her stride, and was not seriously threatened by the time she crossed the wire with a 3/4-length cushion in a final time of 1:41.80 over the good (harrowed) Aqueduct main track. Wadidli Princess, who made her run on the outside, and Elegant Zip, who surged at the rail, finished noses apart in second and third. Another 1 1/4 lengths back Today Comes Once completed the superfecta. Next across the line were Cheatham Hill, Flush, Intoxicologist, Saratoga Style, Shelley Ann and Maiden Beauty. Pat’s No Fool, who is trained by Gary Capuano, did little running in her August 27 debut at Delaware, though well-backed at 2-1. She broke her maiden in her second start, when returning for her seasonal debut on February 23, wiring the field while stretching out from six furlongs to a mile at Laurel. Out of the gate slowly in her first try against winners on February 27 at Laurel, she ran a solid third. Pat’s No Fool was bred by Banahan Farms in partnership with Saratoga Glen Farm and is a half-sister to multiple graded stakes winner Flipcup (Milwaukee Brew). Her dam Dream Affair is a Kentucky-bred Touch Gold mare Dream Affair, who issues from the family of Canadian juvenile champion Wavering Girl. Capuano purchased the filly for $35,000 at the 2017 Keeneland September yearling sale. She now boasts a record of two wins and a third from four starts and has earned $82,545. Dream Affair, who has produced six winners from six foals to start, entered the New York-bred program when purchased by Flipcup’s breeder Team Penney Racing for just $11,000 at the 2007 OBS Winter mixed sale. An RNA at the 2012 Fasig-Tipton New York fall mixed sale when consigned by Saratoga Glen Farm, in 2013 she produced an unraced filly by Giant Surprise named Giant Dreams Await for a partnership of Team Penney and Banahan. The following year she foaled a winning Simmard gelding named Rochester bred by Banahan. Currently Dream Affair has a yearling colt by Mineshaft bred by Saratoga Glen Farm LLC & Beals Racing Stable LLC. Dream Affair was bred in 2018 to Klimt.